Ladies, we all love having thick, luxurious hair. We often take pride in our hair as a symbol of our beauty and femininity. It can make you feel youthful, confident, and desirable. This is why hair loss in women can be especially traumatic. While not every woman suffers from hair loss, hair styling and treatment options that damage our hair are all too common! Let’s take a look at a few of popular hair treatments and the negative impact they can have on your hair. It’s actually not uncommon at all for actresses to suffer from hair loss as a result of over-processing their hair follicles. So what do we mean by damage? Some of us may have experienced it before– dried, dull, brittle hair that can eventually thin out. Harsh chemicals at the salon aren’t the only culprits for thinning hair. Research published in the British Journal of Dermatology has shown that hair extensions can cause traction alopecia. Gasp! We know! How can this be? Well, if not cared for properly, the extra weight of extensions, which are glued, braided or weaved in with a woman’s own hair, can add tension to hair follicles. This includes clip-on extensions, which can cause breakage. And this goes back far longer than you might imagine. Although hair extensions and hair pieces grew wildly in the last decade, they have a far longer history. The custom of wearing trendy wigs and headpieces dates all the way back to the antiquity era. And our suffragette sisters had a particularly interesting (or perhaps horrifying?) method. Edwardian ladies saved the hair from their brush every night after brushing their locks. This extra hair was then used as filling and stuffed inside their pompadour hairdos to obtain those towering styles we see in textbooks. If that wasn’t enough, then they used a “hair rat.” This was a wad of thick padding, made of wool or whatever else, and sometimes attached to other fake hair. A lady’s own hair would then be combed over this so-called “hair rat” and secured properly with pins. Yep, sounds utterly bizarre and also like a lot of work! The good news is that we no longer save the hair from our brushes or stuff our hair with “hair rats!” However, we have our own modern devices for achieving longer, fuller hair with the snap of our (or rather our stylists’) fingers. And as we said, they can do a real number on long-term hair health. So what are we saying? That we should all skip our plush, lavish salon visits and settle for sad lank hair? Absolutely not, we just need to be smart about it! After all, who wants to end up with fried, thin, brittle hair, or worse– with bald spots? Do you recall the saying “prevention is better than cure?” That’s exactly what applies here. Laser hair therapy is a revolutionary, natural technology that is clinically proven to strengthen hair follicles. Although laser hair therapy is often used to treat hair loss, it’s quickly becoming a popular tool in the cosmetic and beauty industries for thickening hair and preventing hair loss. More and more women of all age groups are acquiring and using the Theradome routinely, making it as ubiquitous as their hair dryers. Because let’s face it: following the latest fashionable trend– whether that implies straight or curly hair, dark or blond tresses, a short, layered look or a thick, royal mane– could progressively thin out your hair if you’re not careful. Clinical studies in laser hair therapy show that 97% of users experience minimized shedding, new hair growth, and hair shafts that double in size. We really can’t go wrong with that! Not to mention that salon visits can be costly. If attached properly, hair extensions can be a super glamorous way to upgrade your look. And if having long, luxurious hair has always been your dream, then by all means– you only live once. While salon visits can cost up to a few hundred dollars, high-quality extensions can total up to much more. 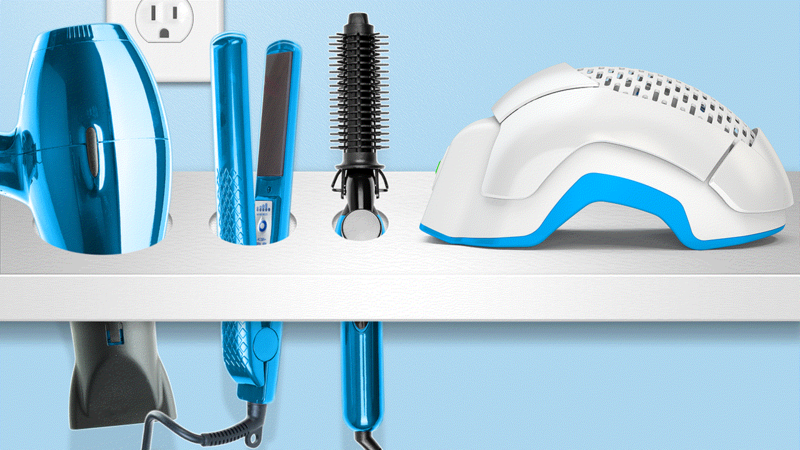 Incorporating laser hair therapy with the modestly priced Theradome LH80 PRO into your weekly beauty regimen can ensure that your own hair doesn’t end up twirling down the drain. Theradome’s powerful laser technology will re-energize the base of your hair follicles and upgrade your beautiful tresses for thicker, fuller hair.